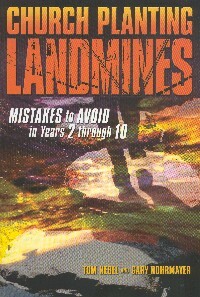 Landmines are little devices that can do a lot of damage. Gary Rohrmayer & Tom Nebel have walked through many minefields together and have the scars to prove it! And yet for 15 plus years they have committed their lives to walking with church planters through the minefields they face. Guiding them away from common dangers. Coaching them through critical junctures. Encouraging them through their defeats. Celebrating their victories and comforting them during their losses. This book is their contribution to the larger church planting community because the world needs more new churches that make it. And not only make it but make a significant impact on our communities, our culture and our world. "Church Planting Landmines comes out of the crucible of experience A practical resource to help new church developers successfully navigate through the "post-honeymoon" period is long overdue. I recommend that church planters reflect carefully and take Spirit-led steps to implement the principles for healthy church growth and multiplication." "After years of drought there is a resurgence of interest in church planting. However, most books on the subject focus only on starting a new church. This practical and insightful book is utterly unique because it focuses on how to overcome the common obstacles to health and growth in new churches. These great men have shared some great insights that help to make a great church." "One of the most practical books on the subject of church planting I’ve seen to date.It should be read by every church planter." "When it comes to coaching church planters I don't know anyone who does it better than Tom and Gary. I can't imagine what our church planting movement would be like without their influence. Now they have written a book that is a must-read for church planters and their coaches." "Most books on church planting provide a road map for launching a new congregation. Nebel and Rohrmayer give us the road signs along the journey that warn of dangers ahead. Heed their advice and the highway construction, bumps and unexpected detours on the church planting road trip do not have to result in stalls, road closures, or crashes. This book is long overdue and should be required reading for every church planter and church planting leader." "Straightforward, easy to read right to the point! Excellent information--filled with practical suggestions. I'm going to make it mandatory reading for our church planters--which is a pretty strong statement for an American Baptist Regional leader!" "Tom and Gary have done a service to the Kingdom with this book! Church Planting Landmines picks up where most church planting books end – with proven, practical wisdom on how to thrive well after the launch. I plan to make the book a gift to our planters on the first anniversary of their launch." "Finally, someone has written a book that deals with the potential dark side of church planting! In their new book, Church Planting Landmines, Tom Nebel and Gary Rohrmayer provide the reader with expert perspective on some of the landmines that can potentially blow the wheels off of the most gifted planters. Having successfully navigated these dangerous waters for many years, both Tom and Gary know what they are talking about. No one should be allowed to plant a church without first having read this powerful book. These gifted church planting veterans can help you to finish your church planting journey well if you will read, and more importantly, live this book." Author of, "Overcoming the Dark Side of Leadership," "Leading from the Inside Out," and "Rethinking the Successful Church." "When I planted two new congregations in 1987 and 1996, getting crowds to come was the relatively easy part. Building those crowds into multiplying congregations was far more difficult. As a church planter and as a coach, I am personally familiar with every land mine outlined in this book. One of them took me out of the game for a time. The pain and toll of treading on these landmines is enormous. People get hurt. Momentum stalls. The short amount of time you take to read this book could save you years of frustration and heartache. Church Planting Landmines is chucked full of vital insights and practical coaching that comes from years of personal experience. Don’t wait– it may be too late."